HOME /Blog /UGears Top 5 coolest 3-d sets. UGears Top 5 coolest 3-d sets. 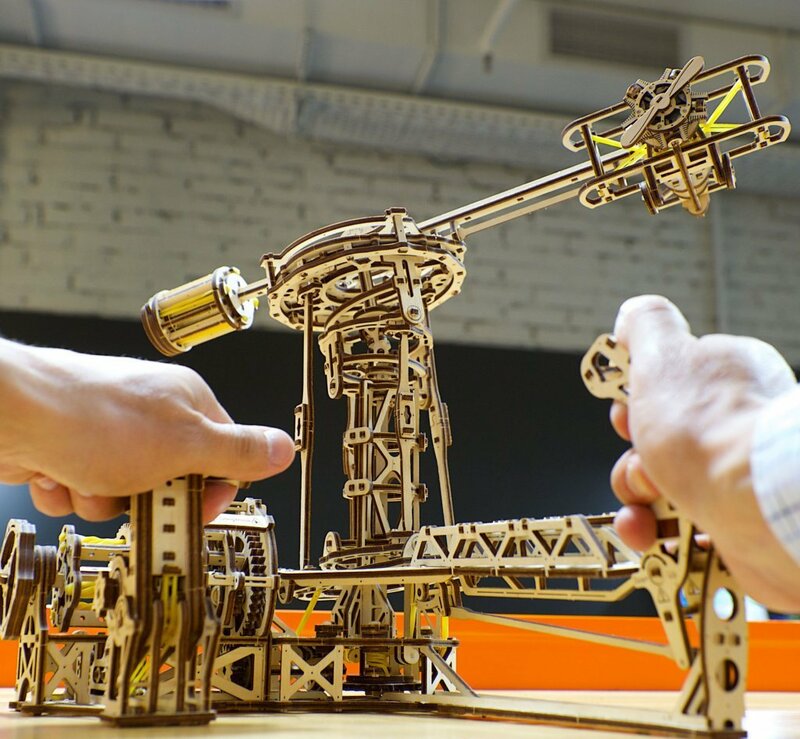 Introducing UGears top 5 coolest 3-d puzzles! 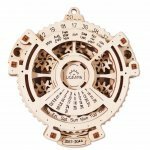 Traditionally made with natural wood materials, these sets feature exceptional design and self-motions, provided by the models’ complex internal mechanisms. Below is the list of these top 5 most popular models. In the 5th place is the Date Navigator. 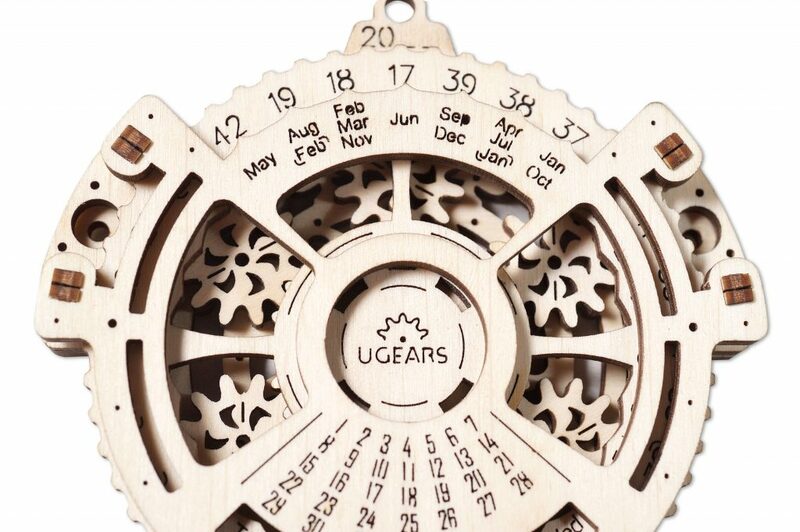 In the essence, Date Navigator is a 2017-2044 mechanical calendar. Despite its simplicity (it consists only of 24 pieces), this model is number 5 in our countdown of the top 5 coolest models. Thoroughly-designed and practical, the Date Navigator is great for everyday use. Model number 4, the Trimaran Merihobus. The Trimaran Merihobus is a 237-piece mechanical model of a sailing yacht! 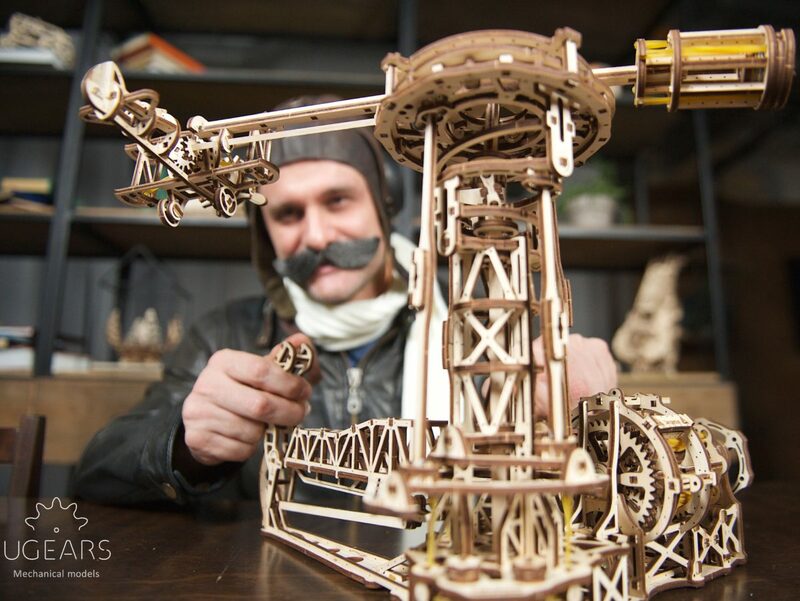 With its impressive 22-inch mast, the Merihobus is a real giant in a family of UGears mechanical models! 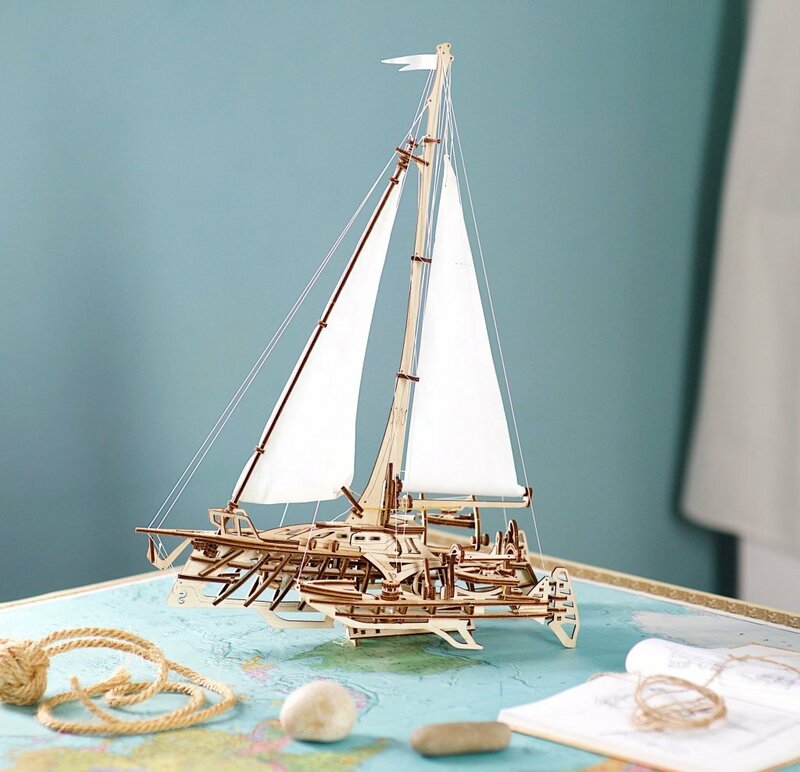 Realistic and fully functioning, it is an ideal gift for the fans of sailing and sea adventures of all ages! The 3rd model on our most-popular list is a Horse Mechanoid. Made of 410 pieces, the Mechanoid is a model of a real horse. But, wait a minute! What is happening? The Mechanoid moves! Powered up by a system of hidden shafts and gears, UGears Horse Mechanoid looks and walks just like the real-life quadruped! 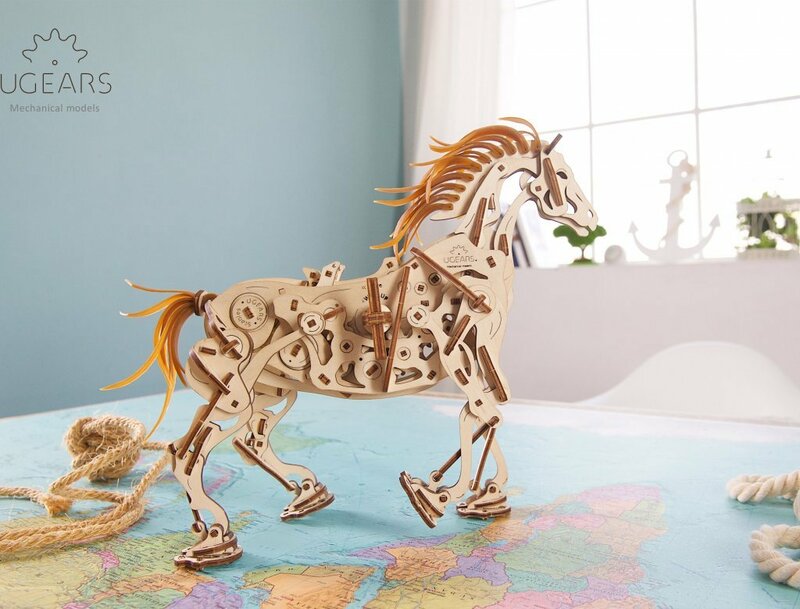 It is absolutely fascinating how UGears toy engineers managed to achieve such stability and balance and made this mechanical horse mimic every move of a real-life horse! The 2nd place goes to the Robot Factory. You’ve heard it right, this model is an entire miniature model of a fully functioning factory! Consisting of 598 pieces, this set impresses with its complexity. The Robot Factory includes the following modules: the conveyor, loading dock and rails, assembly line, service workers and auxiliary robotics! 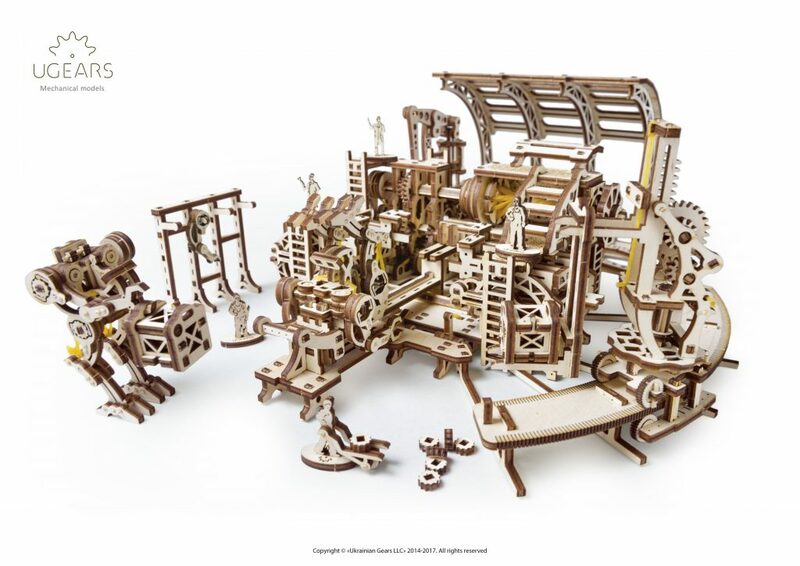 Fun to build and play with, UGears Robot Factory undoubtedly ranks the number two model in our top 5 models countdown. And the very best in our top 5 models, the Aviator. The winner in the top 5 coolest UGears models is the Aviator! This model consists of 726 and is a fully functioning aircraft simulator! After the assembly is complete, you will get the following modules: the flight control tower, the helicopter, and the plane. With UGears Aviator you are in control: launch and navigate your aircraft, set them into roll and pitch modes and regulate its speed and motion, all made possible by the model’s internal rubber-band mechanism. Because of these and many other extraordinary features, we name UGears Aviator number one top coolest model. To order our top 5 coolest models, visit our website and place an order from our online catalog. Join our mailing list and we will keep you posted on the laters UGears news, specials and promotions! 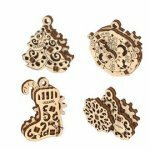 New collection from UGears, the U-Fidget Happy New Gears.